Our Myanmar trip: We begin in Burma's largest city and thriving cultural center, Yangon (formerly Rangoon), home to the Shwedagon Paya (Pagoda), possibly the most impressive single pagoda in existence with a dome covered with nearly 100 tons of gold. From Yangon we'll fly to Bagan (formerly Pagan), where we'll visit the fabulous temple plain dotted with literally thousands of individual temples and pagodas. After that, it's on to famous Mandalay. Although Mandalay is a fairly modern city, the outskirts offer some of Burma's most ancient sites, such as Mingun and Sagaing, the city of monasteries, Buddhist monks and nuns. There are many opportunities here to get excellent images, both of ancient and modern Burma. 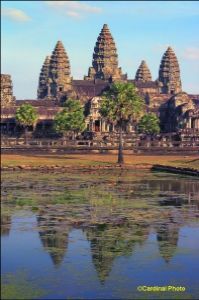 Prior to the trip we'll be offering a pre-trip extension to Angkor Wat & other Cambodian sites. After the trip we'll be offering an extension to other areas in Burma. Details are shown after the information on the main trip. Arrive in Yangon, where we are met by our guide at the airport and transfer to our hotel. We'll do sightseeing as time permits as well as have an orientation and dinner as a group. Downtown Yangon is lively all day and into the evening, and we'll be in the midst of it. Our morning will feature a walk through the historicand colorful downtown area. From there we'll be able to see passenger and cargo steamships plying the Irrawaddy (also spelled Ayeyarwaddy) River and the docks where rice and produce are loaded, unloaded, graded and counted all by hand. As in Cambodia we will always have our own private air-conditioned vehicle, an English speaking local guide and a driver. After a relaxing lunch at one of the excellent local restaurants, we'll have a chance to see one of the indoor attractions like the former house of Aung San or National Museum. Anyone still worn out from their journey is welcome to a siesta. As the day cools and the sun starts to go down, we'll visit the crown jewel of Mayanmar -- the Shwedagon, as many locals and monks do towards the end of the day. The Shwedagon Pagoda features a massive dome with nearly 100 tons of gold finish and a top of diamonds and precious stones. It is alive with hundreds of local Buddhists and monks celebrating, praying and visiting with friends. We've allowed an extra day in Yangon to make sure we have time to review photos from the first half of the trip, discuss important techniques and relax a little before launching into our exploration of Burma. We will have almost two full days to explore and photograph in Bagan's Archaeological Zone, which contains nearly 3,000 recorded monuments in an area roughly 13 by 7 square kilometers. The capital of Burma starting in 1044 when King Anawrahta founded the Bagan Empire, Bagan's temples date back as far as 1500 years. Along with our experienced local guide, we've picked out the best spots to maximize our chances of getting memorable images, especially of sunrise and sunset. We'll also have the treat of a sunset boat ride on the Irrawaddy River, enabling us to experience and photograph not just the sunset in its full glory but also life along the river including the seasonal fishing villages, local residents coming to the river to get their water and bathe and evening river traffic. We'll tour and photograph the world famous lacquer ware makers in Bagan and of course get an opportunity to shop for lacquer ware and other local crafts. Early-risers will start the day with either an (Optional) hot-air ballooning ride or with the opportunity to view sunrise from a temple roof. We'll be back at the Hotel for breakfast on the terrace overlooking the River, with a chance to do a bit of relaxing before we head out to visit more of the amazing plain of temples. The Shwezigon, a smaller sibling of the grand Shwedagon, Ananda, and Manu Paya, are just a few of the famous temples we'll be sure to visit during our stay. Each feature a different set of historic art and architecture from the era of the Bagan Kings. Our meals will often be at restaurants featuring local cuisine, overlooking the River. Flexible, all-inclusive, dining is always part of our small group trips. You don't need to be limited to ordering of a special or set menu (although the guide and I often pick out some of the best dishes to get the meal started), and local wine and beer is always included. So no worries about your diet or needing to mess with paying for drinks or tips or fiddling with the local currency. Just relax and enjoy! One afternoon we board a chartered boat to cruise on the Irrawaddy River, a social and fishing hub for the local tribes. We're likely to be able to see families doing their wash, or just cooling off at the end of the day. If we can, we'll stop off at one of the mobile fishing hamlets on the River and visit with and photograph the locals. Bagan features some of the world's best, and most unique, lacquer ware. We'll get to see how it is made -- a painstaking process involving twenty layers of material and months of effort -- and of course shop for modern or antique versions for those who are interested. The other afternoon we'll finish our cultural visits with a sunset view from one of the picturesque temples with a view across dozens of other temples and the river as the sun sets. Mandalay, the final capital of the Kingdom of Burma before it was defeated by the British, is also known for having over 1,000 monasteries and nunneries, and over 100,000 monks and nuns. It is the center of Buddhist study for Myanmar, and for Theravada Buddhists worldwide. We'll visit and photograph Amarapura, the U Bein bridge, the Sagaing Hills, and the picturesque Mingun, reached by private chartered riverboat. There are hundreds of pagodas and monasteries, and nearly countless monks, enabling us to get great shots of Burma's people as well as its monuments. Sunsets at the bridge and on Mandalay Hill are indeed memorable. We'll visit and photograph the colorful silk-weaving shops and gold-leaf making facilities. Our visit to a nunnery or school will give us an intimate look into the students' daily activities, studying, cooking and visiting. It is through contributions from our groups and others that one nunnery has been able to add a new building for housing and meetings. We'll be staying within walking distance of the ancient palace and many local restaurants and evening activities at a wonderful boutique hotel, which features a nice pool for those wanting to cool off mid-day. We'll head off fairly early for our trip to visit both the famous Pindaya Cave Temple (with over 8,000 Buddha images), and amazing scenes of Shan tribes people farming on gorgeous "colored-checkboard" hill sides. Shan farm plots are interspersed with houses that look as if they belong in Shakespeare's England. The weather is cool here, and the crop mix varied, with a variety of fresh produce. All this makes everyday sites in Shan villages a tourist's dream. I've never seen farmland as colorful as the checkerboard plots in the Shan State, with local families in tribal dress tending them as a group and the men plowing them with Oxen. Our biggest challenge on the drive to the unique Pindaya Caves is not stopping so often that we never arrive. The Cave itself is beyond unique. Featuring thousands of statues of Buddha, arrayed in galleries and configurations of all shapes and sizes, the photographic opportunities are endless but very challenging. Later in the afternoon we'll be driven to the Jetty in Nyaung-Shwe, where we will be taken in long-tailed boats to our hotel located on the shore of the famous Inle Lake in time for a late dinner. Day 10 and Day 11: Full days sightseeing in Inle lake area. Overnight at a lakefront resort. The communities which make up the Inle Lake area live in and above water. Colorful fishing dugouts dot the Lake, singled out by the fishermen holding their seine nets, standing up while rowing with the oar wrapped around one leg. Schools, farms, shops, and homes alike round out the borders of the lake -- many supported on stilts or even floating. Inle Lake is one of the world's richest fishing and farming regions, with luscious crops grown on man-made islands which can be moved around the lake by hand as needed. Children are often rowed to school, and goods are taken by boat to and from the picturesque "5-day" market -- which moves through a series of villages once every five days. Indein, set back on a canal from the lake proper, is the Shan State version of Bagan. Over the centuries, victories were marked by new pagodas, yielding a now grass-entangled field of historic structures at the foot of a large staircase up to a temple with a view of the lake area. Unique crafts are still practiced and practical in the Shan State. We'll see how dugouts and long-tail boats are made by hand, as well as the novel weaving of Lotus flowers into cloth. If we can do it without causing an ethical issue, we'll also get to see and photograph the dramatic brass-ring-necked Padaung women. And we'll certainly have opportunities to photograph the colorful Pa'O women with their distinctive orange head-dresses. Sunrises and especially sunsets on the Lake are perfect times to capture fishermen both front and back-lit. Their triangle-shaped hats make perfect silhouettes in the sun. There are usually some other great photographs of family groups heading home from work and school. A one-of-a-kind collection of historic Shan thrones is also on display at the infamous "jumping cat" monastery -- where the cats are also happy to put on a show. Depending on our flight time we may have a chance for some final sunrise photos of fishermen on the lake, or a visit to the local nursery school. Last trip we used a tablet to show slides from Africa and in exchange the children sang to us. Then we'll go back by long-tailed boat to Nyaung-Shwe for transfer to our bus and flight back to Yangon. For those heading home, their last evening and morning in Yangon represent an opportunity to catch up on any shopping before heading home. The historic Scott Market serves up a nearly endless supply of local goods, ranging from cheap knock-offs to true antiques. The National Museum also beckons, as do the produce docks and Chinatown, depending on how long you have until your flight. The inclusive safari fee for the main trip to Burma is $7,995 per-person, double occupancy (Special discount of $1,000 reduces it to $6,995 until September 17th). The fee includes all airfare from the start of the trip in Yangon until we return to Yangon, all airfare and ground transportation during the trip, your hotel room and food, local wine or beer with meals, bottled water when we're out in the field, guide fees, park, temple and other entrance fees, and photo instruction. It does not include your international airfare to Asia, personal phone usage, additional drinks or laundry, tips for guides, departure taxes, visa fees or other incidentals. If you need your own room, the single supplement is US$1800. Please feel free to email us with questions at: safaris [at] cardinalphoto.com. Last chance to sign-up for our December 2017 trip by putting down a deposit now. but only until September 30th. After that we need to release the space. You can reserve your place with a non-refundable US$2000 deposit per person for trip. The balance of the fee is due 90 days before the trip. If you are worried about having issues which prevent you from going at the last minute please consider getting travel insurance. ​Our first stop is Siem Reap, Cambodia, where we'll spend nearly five days photographing Angkor Wat and some of the dozens of nearby sites and villages. These temples, constructed between the ninth and twelfth centuries represent the apogee of one of the most powerful and influential cultures in Southeast Asian history. The number of worthwhile sites and the opportunity for getting great images are almost limitless. 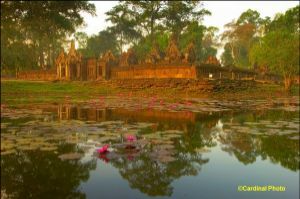 Even if you've been to Angkor before we guarantee to show you new places and new photo opportunities. Arrive in Siem Reap and proceed to hotel for check-in. Visit the famous South and North Gates of Angkor Thom, the famous mile-square city temple which forms the backbone of the overall Angkor temple complex. All travel is done in our own private air-conditioned vehicle with a dedicated English-speaking local guide and a driver. Sunset at Angkor Wat, the crown jewel of Khmer temples. Dinner in the town of Siem Reap along with a walk around the picturesque riverfront area with dozens of quaint shops, restaurants and bars and the local craft market. Sunrise at Angkor Wat at the reflecting pools, followed by a tour of the temple complex including the unique carvings of the Ramayana and the Churning of the Milk Sea. Specific sites such as Angkor Thom, including the South Gate, the high-rising Bayon, Phimeannakas and the Royal Palace, Elephant Terrace, Terrace of the Leper King, Thommanon, and Chao Say Tevoda, as well as Ta Phrom. Dinner in Siem Reap. Sunrise at the beautiful pink sandstone Banteay Srei temple. Return via the hidden gem of Banteay Samre. Lunch near the engineering marvel Preah Khan, and then a visit to the water temple Neak Pean and to the tree covered Ta Som. Sunset photographing the slanting light on the many faces of the Bayon. Dinner in Siem Reap. Sunrise at the ancient Roulos Group, whose temples pre-date the Angkor complex and include the first "mountain temple" of the Khmer, Ba Kong, the inspiration for the later Angkor Wat. We'll see and photograph the seldom visited Roulos Market and the still overgrown and only recently opened Beng Melea. Drinks at the famous Grand Hotel and dinner along the river in Siem Reap. Mid-days in Siem Reap we'll have time to nap or relax around the pool at our air-conditioned hotel, the Prince d'Angkor. We'll take some time either in the afternoon or evening to review images and for some classroom instruction. Most of the one-on-one and small group photo instruction will be done in the field at the various sites. We'll enjoy one last sunrise shoot at Angkor Wat, this time from the under-visited East side, followed by a walk through and around the temple catching the early morning light. After hotel check-out, we'll depart for the nearby Siem Reap airport. You can reserve your place on the Cambodia extension with a non-refundable US$1000 deposit. The balance of the fee is due 90 days before the trip. If you are worried about having issues which prevent you from going at the last minute please consider getting travel insurance. For 2015 we offered an Optional extension to Golden Rock Pagoda & seldom-visited Kayin & Mon States (below). We aren't planning one for this year, but if there is sufficient interest we might add one. After breakfast, drive from Yangon to Kinmon, then up to the Golden Rock Pagoda and our hotel. Famously, the Golden Rock Pagoda is said to balance on a single strand of the Buddha's hair. Overnighting at our hotel on the mountain offers us the opportunity to wander through the pagoda when it is lit up in the evening, and have the site mostly to yourself. After breakfast, drive to Hpa An. Hpa-An is the capital of Kayin State. On the way we will visit famous Bayint Nyi Cave and Kawkun Cave – with numerous Buddha images. We'll stroll through a small Karen village situated at the significant Mount Zwegabin. It will be interesting to compare the local dress, architecture, and customs with those we have seen in other tribal villages along the trip route. Overnight at Hpa An. After breakfast, we'll transfer to Shweyinmyaw jetty to embark private boat to Mawlamyine enjoy the scenic way along the Than Lwin River. We'll visit U Nar Auk’s Kyaung -- arriving at Mawlamyine in the afternoon. Mawlamyine, is the capital of Mon State, situated at the mouth of the Thanlwin River. In the afternoon, we'll be sightseeing in Mawlamyine, including visits to the Seindon Mibaya Monastery- which is donated by King Mindon’s queen and experience sunset from Kyaikthanlan Pagoda. Overnight at Mawlamyine. After breakfast, we'll be driven back to Yangon via Bago -- the ancient capital of the Mon Kingdom, about 80 kilometres northeast of YANGON. Tour highlights include the 55-meter-long SHWETHALYAUNG reclining Buddha image. SHWEMAWDAW PAGODA, over a thousand years old, features a spire that is even taller than the SHWEDAGON PAGODA. We'll also see the famous KYAIK PUN BUDDHA IMAGES -- four 30-meter-high Buddha figures seated back to back. Then we'll be driven back to Yangon, where we'll enjoy a final group dinner together, and overnight in Yangon. Pricing & registration for Golden Rock Pagoda Extension: The exact cost of the extension will depend on how many people sign up. It will be between $2000 and $2500 per-person, double occupancy, with a $500 single supplement if available. 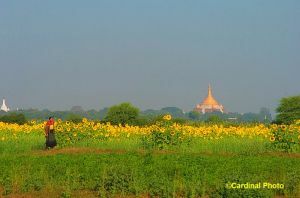 For photos and an account of some of our early tours to Burma, please read my article on our December 2007 safari. See our January 2007 safari: Burma from Buddha to Orwell and my 2005 trip: Burma: The Land that Time Forgot for more insights. For additional photos and an account of our early trips to the Angkor temples in Cambodia you can read DigitalPro Shooter 3-1: Photographing the Magic of Angkor Wat. Non-photographers are always welcome, especially as companions of photographers on the trip. This trip has proven quite popular for couples in particular. There are always alternative activities provided for times when we are working on images, and non-shooting companions are of course invited to be part of any of the talks or slide shows that are of interest to them. If we have enough non-photographers, we'll invest in two vehicles and a second guide, to provide even more flexibility so participants can pursue differing interests during the day. This trip is limited to a maximum of 8 photographers, both to ensure plenty of personal instruction and to make sure we have lots of flexibility in our itinerary and schedule -- we have a plan for each day of the trip but some of the most fun is to take advantage of unique local opportunities such as weddings or other festivals and having a small group lets us do that. Photo Instruction: All participants will have plenty of one-on-one personal instruction time while we're in the field. We'll also have focused sessions on taking great scenics and travel photographs, including panoramas. All by award-winning photographer David Cardinal. Classroom Photo Instruction: As always, we will be providing optional photo instruction in digital workflow, image editing and image enhancement using Photoshop. We'll be staying at wonderful hotels throughout the trip, typically among the best available at each location. We work with privately owned and where possible, locally owned properties that offer friendly service and full amenities. Interested? You can sign-up online or call us at +1.650.851-8350.